I really had to rewrite this after spending some more time with this amp...after some of the fascination wore off. And after figuring out how I ended up with one of these. I had purchased the companion tuner..a KT-7500 that had some potential. And it has lived up to the potential after doing some of the common mods...power supply recap/new diodes and replace the output opamp. Thinking that the matching silver faced beauty with the KA-7100 might bear some fruit, and after reading on a particular forum that this should be the case, I fell for it. At first, I was struck by the amount of detail I found after the bias and offset were adjusted properly. But there was always this nagging level of grain...it just wasn't smooth. And this was still after doing a major chunk of recapping. Finally it decided to go into fail mode, doing more damage than I really wanted to fix or invest in...one of the issues with direct coupling in circuits. This just turned out to be bad experience. A pretty face that hides 70's solid state sound. I'm starting to think all these guys that dig the sound only tolerate it because they use speakers from the same era. Won't get fooled again. This amp is hands down the best looking amp I have ever seen, the recessed volume knob, stamped lettering on the face all reek of quality, mine is paired with the matching tuner and I LOVE how it looks. The sound...., well let me tell you they don't make them like this any more, if they did no one would ever buy another stereo system. Built like a tank and plays beautifully, mids and highs are very nice. I have run TT, MP3 and CD through it and no matter what she plays beautiful. If you happen upon this unit don't pass it by, the Kennies are VASTLY underrated and you can still get them comparatively cheap in relation to comparable's by other brands. The bass is a little shy but that may mean a tune up and servicing. Very nice amp. 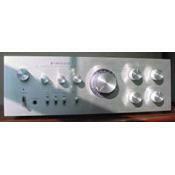 many people prize these Kenwood integrateds. Serviced myself- easy to work on.